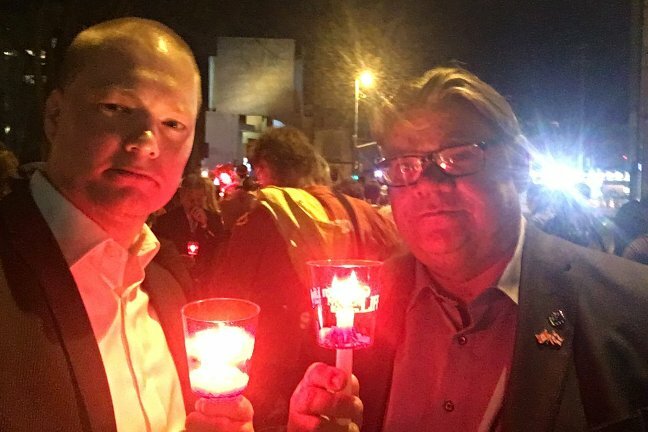 Timo Soini (right) at a pro-life vigil in Ottowa. In an encouraging example of what can happen when politicians stand by their principles, a pro-life minister in Finland has survived a vote of no confidence. Timo Soini, the Finnish Foreign Minister, won a confidence vote brought by four opposition parties by 100 votes to 60. Mr. Soini, a convert to Catholicism in predominately Lutheran Finland, has faced repeated criticism for his outspoken views on abortion, particularly since attending a pro-life candle-lit vigil in Canada while on an official trip. He has also come under fire for lamenting the legalisation of abortion in Ireland and for congratulating Argentine lawmakers for voting down a pro-abortion motion there. At the time, Mr. Soini said he attended the Canadian rally as a private individual, rather than as Foreign Minister. Later he also reiterated and defended his opposition to abortion in his blog, saying “how odd it is that someone would have to defend the right to defend life”. Complaints against him led to the Chancellor for Justice investigating the issue. Earlier this week, he said that it was “problematic” that the Foreign Minister had expressed a view contrary to Finland’s official position on abortion but admitted that he had broken no laws. Defending himself, Mr. Soini pointed out that executing his duties as foreign minister did not prevent him from enjoying his fundamental rights. “Participation in the candlelight vigil in memory of the victims of abortion was an expression of my sincere and genuine religious beliefs and my faith, which both enjoy the protection of the freedom of thought, conscience and religion,” he wrote. In response to previous criticism, Timo Soini said: “Sometimes you have to have the courage to be a one-man majority.” His courage in speaking out for the unborn in a Parliament even more hostile than our own, is certainly inspiring.